Provence in southern France is a land of azure blue seas and snow-clad mountains, of small hillside villages topped with fortified castles and cities of art and culture, fields of sweet-smelling lavender and groves of ancient olive trees. Provence, which takes in the towering Alps and the French Riviera (not forgetting Monte Carlo and its famous Casino), is one of France's most seductive and popular areas for visitors. You can fly into Marseille-Provence Airport from the USA with one stop-over. Nice-Côte d'Azur Airport has direct flights from the USA. Or arrive by train in Marseille or Nice from other European and French cities—by far the best way to see the countryside. With so many wonderful places to stay and explore away from the main cities and train stations, it's best to tour the region by car. But if driving seems daunting, don't worry—southern France has one of Europe's best transport networks and trains and local buses are a great way to travel. And you get to meet the locals. While many people associate the French Riviera with little hilltop villages perched high above the sea rather than French cities, there are some very attractive large towns to visit, each with its own particular character. France's largest tourist resort has everything: a wonderful Mediterranean location right at the heart of the French Riviera, 19th-century architecture, an old town of squares and narrow winding streets lined with small bistros and restaurants, great museums and a buzzing nightlife. Of all the major French cities, Nice is one of the most popular for visitors. Hugging the banks of the Rhône River, Avignon is dominated by the fortress-like Palais des Papes (Palace of the Popes), the home of the French Popes who lived here for most of the 14th century. Avignon, another of the most attractive French cities in the region, offers art and culture by the bucket load and offers wonderful opportunities for photography. Cosmopolitan restaurants, picturesque streets, and elegant buildings, Aix is sophisticated, chic and artistic, the inspiration for painters like Paul Cézanne who was born here in 1839. Described by Alexander Dumas as "the meeting place of the entire world" and centered around the old port, Marseille is an exhilerating place to visit. There's something for every visitor, while the adventurous can try the great climbing in the nearby dramatic Calanques massif. Superb beaches, a casino and the world's greatest film festival. Cannes is all about looking rich and famous (even if you're not). Of all the French cities in the south, Cannes sums up the glamor of the French Riviera. 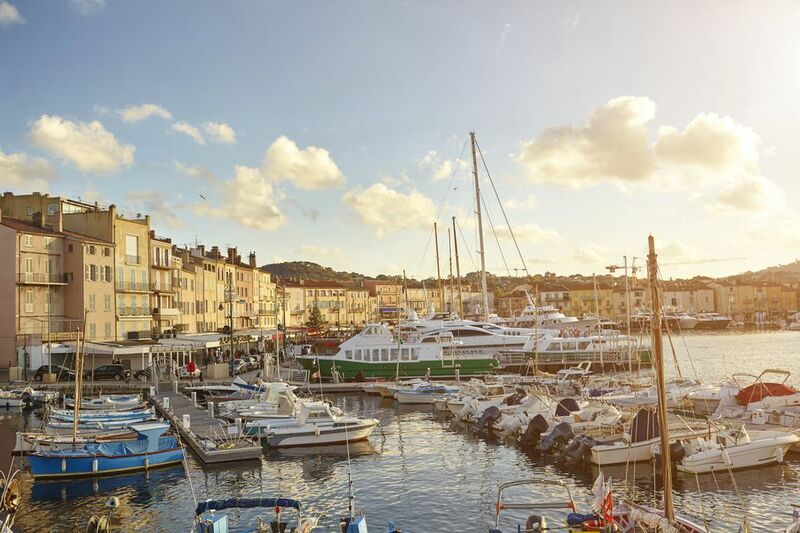 Glamorous, chic and extremely crowded in the summer months, St Tropez is another of the top destinations on the French Riviera. It has boutique hotels which are some of the best in France, restaurants and bars that stay open into the small hours of the night, and a visitor list that includes most of the Hollywood A-list particularly at the time of the Cannes Film Festival each year in May. Ride the white horses of the marshlands of the Camargue in the Rhône Delta or go and see the cowboys who round up the famous bulls in this remote corner of southern France. Walk through the rightly named Vallée des Merveilles, the most spectacular part of Mercantour National Park. It's just one of the many glorious walks you can take, either guided or solo, following the well-marked system of Grandes Randonées (GR) paths. Go back to Provence's Roman roots in the splendid amphitheatre in Arles where 2,000 years ago, gladiators fought and chariots raced to the roar of the crowds. Today it echoes to the sounds of bullfights and music festivals. Looking around other people's houses is one of life's great pleasures. But it's even better when it's the home of an artist we know only through the paintings. Walk through the faded house of Auguste Renoir at Cagnes-sur-Mer and you can imagine the great artist sitting at his easel painting the beauties of the day. You can't come to Provence and not visit an outdoor market. It's a morning affair; by noon the stallholders are beginning to pack away before a good lunch in a nearby bistro. Stalls piled high with herbs, cheeses, ripe fruit and the freshest vegetables fill the covered market place in Antibes daily; the range of fish in Marseille is a marvel, while the flower stalls in the Cours Saleya in Nice offer a heady mix of colors and scents. Watch out for summer bric-a-brac markets where old French bowls for morning coffee, maps, furniture and memorabilia will bring a touch of Provence into your home. Go to L'isle sur la Sorgue for antiques. There are weekly markets, but almost every shop is an antique dealer, offering a range from bric a brac to the priciest. If you stick to the Mediterranean coast, however tempting, you'll miss the glorious scenery, the high escarpments and green valleys you discover on roads that seem to wind their way up to the sky. Not to mention villages where the only sounds disturbing the peace are the crickets chirping and the click of boules as the locals spend a lazy afternoon in the village square. One of the best road trips is around the Gorges du Verdon. If you're touring the area for more than 21 days in a hired car, consider Renault Eurodrive's Buy Back Scheme. There's every type of accommodation on offer in Provence. Some of France's top hotels, a wealth of welcoming chambres d'hôtes (bed and breakfasts) in old Provençal farmhouses, beautifully decorated villas to hire by the week, top boutique hotels and campsites set in ancient olive groves—take your pick. For luxury, book into L'Hostellerie de Crillon le Brave, a hotel made up from a collection of old houses near Avignon. Fancy something less formal? Try bed and breakfast at Le Clos des Lavandes, a charming old house surrounded by fragrant lavender fields high up in the hills of the Luberon. Or camp in gently sloping fields or on sites that lead onto a Mediterranean beach. Skiing in Provence is not the high-octane, glamorous experience it is in resorts like Chamonix. Here the skiing is low-key, casual and great for families. Isola 2000, Auron, and Valberg are accessible from Nice for a day's skiing. The big sports in this part of the world are, not surprisingly, water-based. So hire a mega yacht for the day or week. If this is not your particular bag, try a smaller yacht in historic Antibes, or in Cannes, Mandelieu-La-Napoule, Marseille, and St-Raphael. All the other ways of speeding over the water from windsurfing to rides in a rubber ring are readily available.